First impressions last. While it may have been French inspired, our first lunch at Aubine in London’s trendy Mayfair district left a pleasant taste in our mouths from first to last bite. It was the perfect start to what promised to be a visit to a foodie’s paradise. Many times a good friend told us London is the best food city. We now wholeheartedly agree. But more research is required. Too many restaurants, too little time … c’est la vie. Aubine was just the beginning of our culinary adventure, but a noteworthy one that set up a trip of pure taste pleasure. I was even more surprised to find out later the bistro is part of a chain. Thanks to our tour guide, Federico, for recommending this panini-making paradise. The long line at All’Antico Vinaio and our rumbling stomach led us astray one day, but we returned the next a little earlier to make good on our panini passion. Now we know the shop churns out sandwiches well worth the wait. We spiced up our paninis with sun-dried tomato and artichoke spreads. Other delicious choices included a tomato-based meat sauce, marinated zucchini shavings, smoked eggplant, creamy cheese dressing and truffle paste. Another nice feature is the self-service wine bar with small glasses you can take to the curb with you as you savor your sandwich. Perfecto! Move over margarita. There's a new drink in my life. It's a fine mix of Nolet’s gin, kumquat syrup and lemon juice in St-Germain elderflower liqueur-rinsed coupe glass. 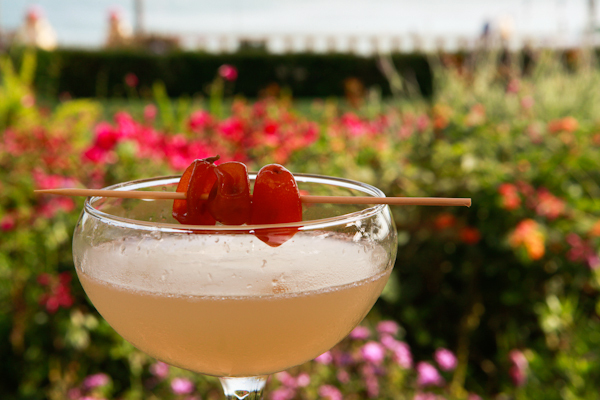 Cheers to @FSSantaBarbara! Our foodie friends recommended it and we wholeheartedly agree. The Shake Shack at Madison Square Park in New York City turns out some awesome burgers. Sure. Around lunchtime you’re likely to wait in line a while. But take advantage of the time for some juicy eavesdropping among fellow patrons as you contemplate your best burger move.